Welcome to beautifully made and oh so comfortable T-shirt dresses, shift dresses and the ever popular maxi. There’s nothing better than finding a beautiful dress that’s comfortable as well as flattering. At Lands’ End, our women’s dresses and skirts are designed to fulfil both criteria. With thoughtful touches and eye-catching details, our range of women’s dresses and skirts are sure to turn heads. Our dresses feature an array of flattering necklines and considered skirt styles so they always sit just right on your body. Our versatile skirts pair beautifully with pretty much everything in your wardrobe, making them a perfect option for work-to-weekend wear. With our dresses and skirts available in Regular, Petite and Plus sizes, you’re sure to find your perfect fit among our collection. We’re also careful with our choice of fabrics to ensure our dresses and skirts provide just the right balance of soft elegance and tailored support. You’ll find many of our styles use the Ponte jersey fabric. The anti-cling material has just the right amount of heaviness to it, allowing the fabric to softly drape across your body and helping it translate well across a range of dress styles. Other fabrics include an airy piqué cotton which stretches slightly for breathable summer comfort, and the wonderfully soft Supima® cotton-rich knit which gives a soft feel, perfect for warmer weather. 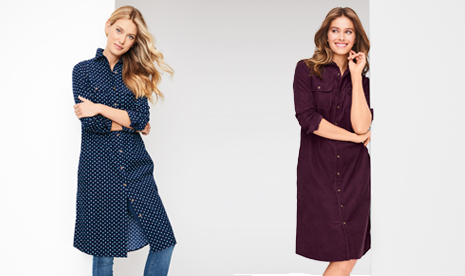 Our season-spanning long-sleeved and elbow-length sleeved dresses are also great options for the cooler months, or if you’re simply looking for a little more cover. Of course, you can add a beautiful cardigan to any of our dresses to instantly transform them from summer chic to autumn cosiness.